New Winter 2018: Let your diamond darling know she’s a winner on and off the field with a girls softball ornament personalized to be her favorite! 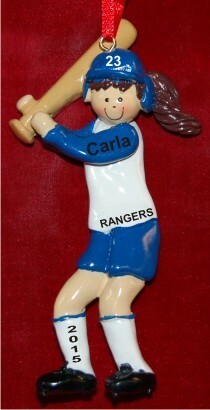 The girls softball blue uniform brunette hair personalized ornament features a batter ready to drive in some runs and sports all the details you provide. They’ll be hand painted where shown using an attractive font, so the softball girl personalized Christmas ornament she receives will be one of a kind. Like many of our personalized sports ornaments for girls, this one arrives in our classic velvet gift and storage pouch with a display cord already attached.